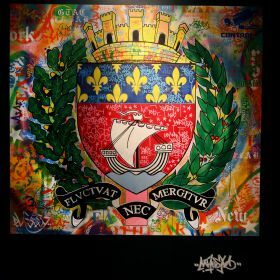 Maest started graffitti in 1993 in Marseille. In 2000, he moved to Issy Les Moulineaux, and joined the collective RDC. In 2006, meeting Epsylon Point will change everything about his vision. He will learn stencil technic and acquire many other notions and evolve technically. He painted at Molitor shortly after the november 2015 attacks, his wall pays tribute and condemns all at once.